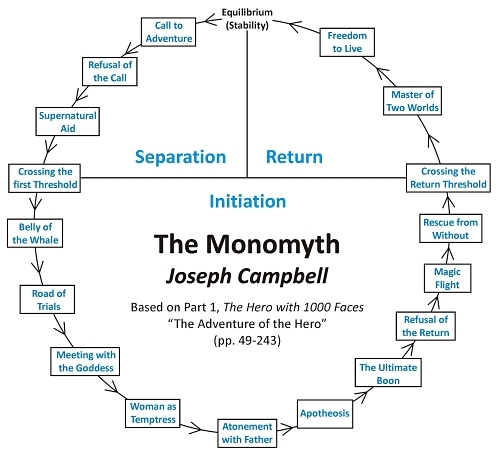 Joseph Campbell studied Carl Jung, who studied magic and alchemy. Campbell’s work is all about mythology. The Spotify playlist below contains over 48 hours of his lectures. You’ll love it if you’re a budding writer or just interested in mythology. “The first stage in the hero adventure, when he starts off on adventure, is leaving the realm of light, which he controls and knows about, and moving toward the threshold. And it’s at the threshold that the monster of the abyss comes to meet him. And then there are two or three results: one, the hero is cut to pieces and descends into the abyss in fragments, to be resurrected; or he may kill the dragon power.. But then he tastes the dragon blood, that is to say, he has to assimilate that power..
You see, this thing up here, this consciousness [points to brain], thinks it’s running the shop. It’s a secondary organ; it’s a secondary organ of a total human being, and it must not put itself in control. It must submit and serve the humanity of the body. When it does put itself in control, you get this Vader, [Darthvader] the man who’s gone over to the intellectual [and mechanistic] side. He isn’t thinking, or living in terms of humanity, he’s living in terms of a system. And this is the threat to our lives; we all face it, we all operate in our society in relation to a system. Now, is the system going to eat you up and relieve you of your humanity, or are you going to be able to use the system to human purposes? I don’t think it would help you to change the system, but it would help you to live in the system as a human being. Lke Luke Skywalker, not going over, but resisting its impersonal claims. If the person doesn’t listen to the demands of his own spiritual and heart life, and insists on a certain program, you’re going to have a schizophrenic crack-up. The person has put himself off-center; he has aligned himself with a programmatic life, and it’s not the one the body [and the heart] is interested in at all. And the world’s full of people who have stopped listening to themselves. In my own life, I’ve had many opportunities to commit myself to a system and to go with it, and to obey its requirements. My life has been that of a maverick; I would not submit. Our life evokes our character, and you find out more about yourself as you go on. And it’s very nice to be able to put yourself in situations that will evoke your higher nature, rather than your lower. What you have done has been to elevate yourself out of the local field and put yourself in the field of higher power, higher danger. And are you going to be able to handle it? If you are not eligible for this place into which you’ve put yourself, it’s going to be a demon marriage, it’s going to be a real mess. If you are eligible, it can be a glory that will give you a life that is yours, in your own way. It’s the edge, the interface between what can be known and what is never to be discovered, because it is a mystery transcendent of all human research. The source of life: what is it? No one knows. I think it’s important to live life with a knowledge of its mystery and of your own mystery, and it gives life a new zest, a new balance, a new harmony to do this. I mean, in therapy, in psychological therapy, when people find out what it is that’s ticking in them, they get straightened out. And what is it that life is. I find thinking in mythological terms has helped people, visibly you can see it happen. The real dragon is in you. That’s your ego, holding you in. What I want, what I believe, what I can do, what I think I love, and all that. What I regard as the aim of my life and so forth. It might be too small. It might be that which pins you down. And if it’s simply that of doing what the environment tells you to do, it certainly is pinning you down. And so the environment is your dragon, as it reflects within yourself. How do you [slay the dragon within yourself]? My general formula for my students is, follow your bliss, I mean, find where it is, and don’t be afraid to follow it. And in doing that, you save the world. I mean, you do. The influence of a vital person vitalizes, there’s no doubt about it. The world is a wasteland. People have the notion of saving the world by shifting it around and changing the rules and so forth. No, any world is a living world if it’s alive, and the thing is to bring it to life. And the way to bring it to life is to find in your own case where your life is, and be alive yourself, it seems to me. If you have someone who can help you, that’s fine, too. But ultimately the last trick has to be done by you. [There’s] a place in yourself of rest. Now this I know a little bit about from athletics. The athlete who is in championship form has a quiet place in himself. And it’s out of that that his action comes. If he’s all in the action field, he’s not performing properly. There’s a center out of which you act. And Jean, my wife, a dancer, tells me that in dance this is true, too, there’s the center that has to be known and held. There it’s quite physically recognized by the person. But unless this center has been found, you’re torn apart, tension comes. Now, the Buddha’s word is nirvana; nirvana is a psychological slate of mind. It’s not a place, like heaven, it’s not something that’s not here; it is here, in the middle of the turmoil, what’s called samsara, the whirlpool of life conditions. That nirvana is what, is the condition that comes when you are not compelled by desire or by fear, or by social commitments, when you hold your center and act out of there. The way… how should I get rid of fear? The Buddha can’t tell me how I’m going to do it. There are exercises that different teachers will give you, but they may not work for you. And all a teacher can do is give you a clue of the direction. He’s like a lighthouse that says there are rocks over here, and steer clear. [Nature is consciousness.] There is a plant consciousness, there is an animal consciousness. We share all of these things. You eat certain foods, and the bile knows whether there’s something there for it to go to work on. The whole thing is consciousness. I begin to feel more and more that the whole world is conscious; certainly the vegetable world is conscious, and when you live in the woods, as I did as a kid, you can see all these different consciousnesses relating to themselves. The whole planet [Mother Earth] as an organism. If [we] think of ourselves as coming out of the earth, rather than as being thrown in here from somewhere else, you know, thrown out of the earth, we are the earth, we are the consciousness of the earth. These are the eyes of the earth, and this is the voice of the earth. What else? All of life is a meditation, most of it unintentional. A lot of people spend most of it in meditating on where their money’s coming from and where it’s going to go, but that’s a level of meditation. Or, if you have a family to bring up, you’re concerned for the family. These are all perfectly, very important concerns, but they have to do with physical conditions, mostly, and spiritual conditions of the children, of course. But how are you going to communicate spiritual consciousness to the children if you don’t have it yourself? So how do you get that? Then you think about the myths. What the myths are for is to bring us into a level of consciousness that is spiritual. Myths and dreams come from the same place; they come from realizations of some kind that have then to find expression in symbolic form. And the myth, the only myth that’s going to be worth thinking about in the immediate future is one that’s talking about the planet not this city, not these people, but the planet and everybody on it. That’s my main thought for what the future myth is going to be. And what it will have to deal with will be exactly what all myths have dealt with: the maturation of the individual, [the way] to follow, from dependency through adulthood to maturity, and then to the exit and how to do it. And then how to relate to this society, and how to relate this society to the world of nature and the cosmos. That’s what the myths have all talked about; that’s what this one’s got to talk about. But the society that it’s going to talk about is the society of the planet, and until that gets going, you don’t have anything.